One thing that I have noticed as a near constant are mistakes forgetting to update drawing notes after making changes to the model. We are often under time pressure, product design pressure and the pressure to get products updated and out as fast as possible. With all this going on it is not surprising that we may miss one or two minor details like updating notes on a drawing. That is why I often try to find ways that will update some of these details automatically. The process I describe can be used on any model and drawing. I like to use this workflow with iLogic models that update the description, part number and other properties automatically. With a configurable model, I often forget to update notes on my drawing so this process is a useful tool. I am going to work with two iProperties, Part Number and Description as seen below from my models iProperties Project tab. Go to your drawing and start the text tool. Type a descriptor of what you want to insert. Prepare to insert the iProperty by adding any spaces or further text as needed. From the Type pull-down select Properties – Model. From the Property pull-down select the relevant property that you would like to insert. In my case, I will add DESCRIPTION. Select the Add Text Parameter button to insert the parameter. In my example, I am adding two iProperties as shown below. Once applied the result is as below. If the Description or Part Number should ever change in the model the drawing will automatically update with the correct information. 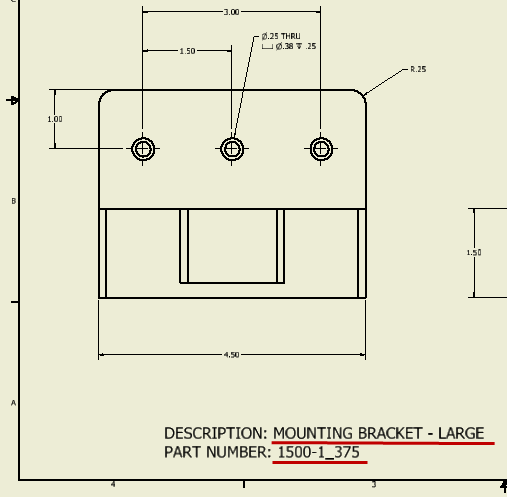 In the example below, I have changed the model Description to “MOUNTING BRACKET – LARGE” and the Part Number to 1500-1_375. The drawing will automatically update. With this technique, you can add many different property fields including Custom iProperties. Play around with it and see what fields you use often that can help you reduce silly errors and miss simple tasks. I use this technic all the time because I do often forget some of these simple updates because I am often too focused on the “BIG” issues!